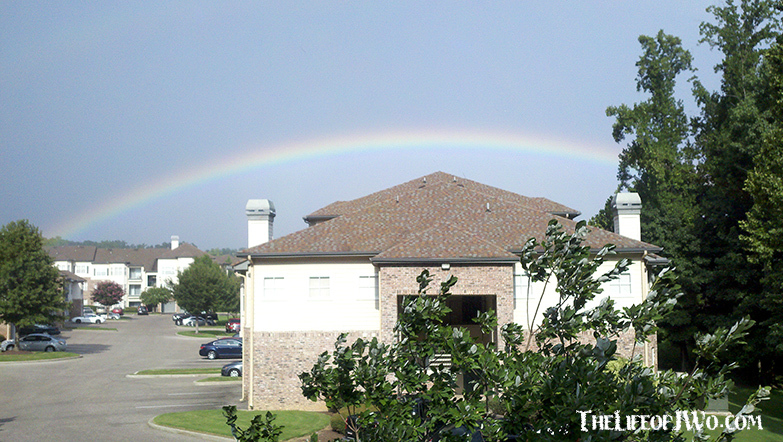 This past week was unusual in the Bluff City for several different reasons. 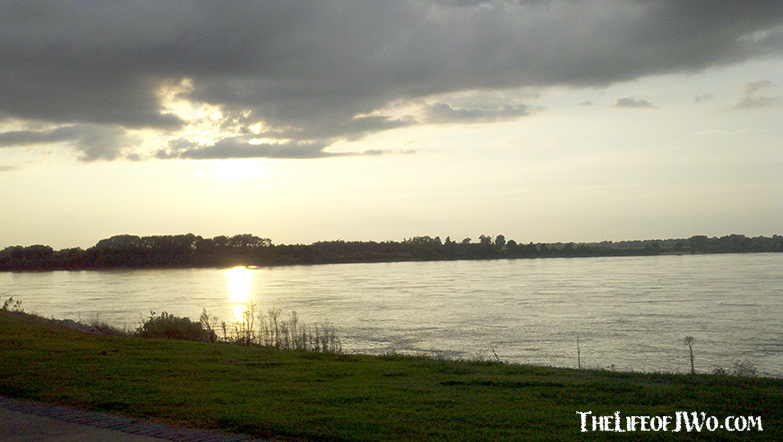 First, it wasn’t excruciatingly hot, with highs in the mid-80s (instead of around 100º) and second it was Elvis Week. Downtown Memphis is covered with tons of Elvis fans and impersonators and everywhere you turn there are reminders of the King. From the specials Elvis concert and movie showings at the Orpheum downtown to the candlelight vigil held at the gates for Graceland, there is literally something for everyone. Somehow Tammy and I forgot about the craziness of Elvis Week and ventured downtown to catch a Memphis Redbirds (minor league baseball) game Saturday afternoon. I think it was because we saw a rainbow before we left that made me think it was going to be an awesome evening. This means good things, right? We stood in line for about 30 minutes to exchange our vouchers for tickets but were told all they had left were Standing Room Only. Since neither of us really care for baseball and were only there for the food, we decided to pass. Walking back and getting out of the garage took another 20 minutes but we eventually found out way to Tom Lee Park, found a bench and settled in for the sunset. It was pretty cool watching dark clouds roll over downtown, but we thought the rain was behind us, having driven through some showers on our way to the game. 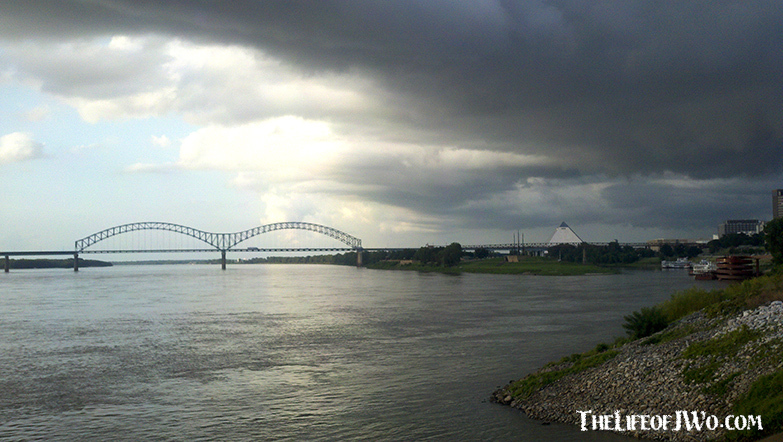 Storm clouds rolling over The Pyramid and downtown Memphis. Once again we were wrong. We could see the rain starting on the other side of the bridge and could hear it getting closer. We waited for a few drops to hit around us before bolting to the car and heading back home, wet and hungry. It might not have been the night we planned, but Tammy and I definitely had a good time. Plus, it just goes to show that you never know what’s going to happen around you and that you should always be prepared. I was prepared when I caught this week’s edition of Things I Have Overheard. Sounds like a homeless person is nearby. Why chain it up? Nobody can ride it. Gallery | This entry was posted in Daily Life, Things I Have Overheard and tagged daily life, Elvis, humor, life, Memphis, overheard, people, Postaweek2013, Tammy, Things I Have Overheard, Travel. Bookmark the permalink. By now I think you know which ones I found very funny.